Drips and seepage from plumbing pipes that run through the crawl space or basement are generally out of sight and may happen without your knowledge. As the immediate area remains saturated, this ongoing moisture source continuously sends water vapor into the house. Bathroom components such as the bathtub and the shower stall may covertly leak every time the fixture is used. This water infiltrates through the sub-floor and soaks the zone beneath the bathroom. Water vapor rising boosts indoor humidity. Rainwater overflowing clogged gutters saturates the soil adjacent to the crawl space or basement walls. High soil water content migrates beneath the house and becomes a source of increasing humidity. 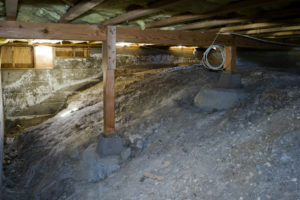 Passive ventilation of the crawl space and basement helps purge accumulating water vapor. Vent grates can be installed in the side of the home or in the foundation sill to enhance ventilation. Specialized crawl space and basement dehumidifiers are also designed to extract water vapor from the air and maintain pre-set humidity levels in those trouble zones. Ask the professionals at Hartman Brothers about proven methods to identify and remediate excess humidity effects in your home.